I can't remember the guy I went with but he brought some extremely potent pot and they sounded so "BIG" that night because of it. I remember waiting to get in the front door for probably 15 minutes, but it felt like hours, just completely baked. 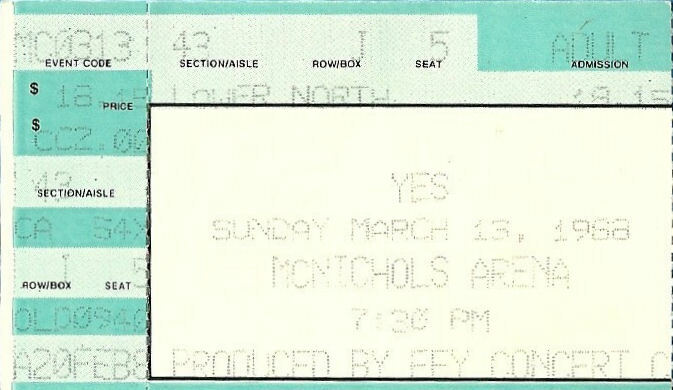 This was my first Yes concert - my friend Steve and I sat in the parking lot at McNichols Arena, drinking cheap beer and listening to 'Tormato.' I was not particularly familiar with 'Big Generator' at the time - only 'Love Will Find A Way' and 'Rhythm of Love,' which both had videos on MTV (I was 17 at the time) - but, was intimately familiar with all of the previous albums. I was both delighted and disappointed with the show. On the one hand, it was very exciting to finally see this group that I had grown to love over the previous three years - I had become a fan just after the release of '90125,' but, after they had made their two stops in Colorado during that tour (though, I knew someone that I had seen one of the shows). But, I was disappointed, because I was something of a 'Trooper' at the time and - though, I liked '90125' - wished that they played MORE of the classic material. Of course, this was way before I had any idea Yes (or any other band, for that matter - this was probably the 3rd or 4th concert I'd ever seen) tours were like - as far as I was concerned, they COULD'VE been playing 'Close to the Edge' in the other cities and we in Denver were getting stuck with 'Almost Like Love' or whatever. From where we were sitting, we really couldn't see anything - almost fourteen years later, the only thing I really remember is the 'Mighty Mouse' (or whatever) cartoon that opened the show and the 'Wurm' segment. I kept thinking, 'OK, now we're getting somewhere!' Having since heard an audience recording of the show, I think I appreciate this concert more NOW than I did at the time - I liked it, but, it didn't seem particularly moving, even at the time. Even at the time, I thought Trevor's 'Solly's Beard' solo was stupid; I've really grown to appreciate Trevor, but, I still think that solo is stupid. Every Yes show I've seen since this was far superior, yet, had this one not been great in it's own way, perhaps my love affair with Yes music would've ended with my teens.